certification as concrete and aggregate testing. 10), tens of miles of bridges, miles of earthen dam, numerous mid to high rise structures. from landfills and evaluation of the flow pattern of pollutants from landfill operations. written and implemented such plans for large projects and selected clients. • Designed various types of foundation systems for use in transmission line construction. piles, and drilled shafts. Also, he has provided design services for earth work construction. procedures to aid in reducing man power and equipment requirements. 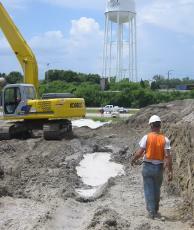 services during mediation and trial for large roadway and vertical construction projects. served as the examiner at numerous ACI examinations. Long Ann Province, Viet Nam.